CD Duplication is the process of 'burning' data to a high quality blank CD-R and performing high quality printing direct to the disc surface. This process is significantly quicker and cheaper than replication for orders below 500 units. 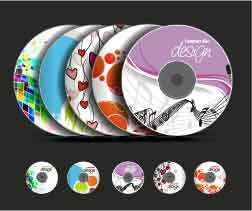 Printing on to blank CD-Rs For clients who need to burn their own CDs, we recommend utilising our CD printing services. We can print in colour or black directly onto blank CD-Rs. Need some copies made in a hurry? For the quickest turnaround of any quantity (no minimum) of DVDs, we recommend utilising our DVD Burning service, combining premium quality with rapid turnaround. We operate the latest robotic DVD replication system, enhanced by in-line colour inkjet printing to produce perfect DVDs. For smaller duplication runs of up to 500 DVDs : Quick turnaround DVD-R record up to 4.7GB High definition black or CMYK (4-colour) inkjet print DVD Labels printed directly onto the DVD, generated from digital artwork (no film/plates set up required) Packaging cases to enhance presentation Printing of booklets and slicks Hand packing of DVDs / Inserts into cases Shrink wrapping. Inkjet Printed Blank DVD-Rs : For clients who need to burn their own DVDs, we recommend utilising our DVD printing services. Colour or black inkjet printing is printed directly onto blank DVD-Rs. Many of our clients utilise this service to burn their own DVDs using printed stock which looks professional, reinforces corporate image and adds to security.